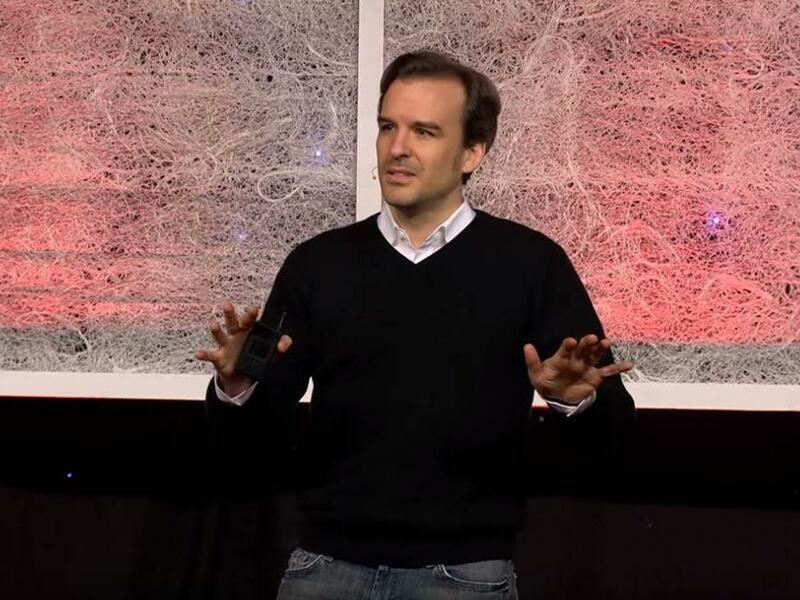 Jochen Menges is a researcher at the University of Cambridge and a professor of leadership at the Otto Beisheim School of Management in Germany.He received his doctoral degree in management from the University of St. Gallen, and completed his undergraduate and graduate degrees in psychology at the University of Heidelberg. It's the TED Radio Hour from NPR. I'm Guy Raz. And on the show today - ideas about the leaders and the movements that inspire us to take action. And for Jochen Menges, the key is charisma. RAZ: Jochen's been studying charismatic leaders for more than a decade, ever since 2008, when he went to a speech Barack Obama gave in Berlin. MENGES: It was a very warm July day, and I still vividly remember that moment when he walked up to that stage. And he took a while, and he was waving, and people were cheering and waking up. BARACK OBAMA: Well, thank you, Mayor Wowereit. MENGES: ...Make people stop applaud. OBAMA: People of Berlin and Germany, thank you for this extraordinarily warm welcome. MENGES: Then all of a sudden, it became very quiet. OBAMA: For thousands of years, the people of this land have journeyed from tribe to principality to nation-state. MENGES: You know, he started to talk, and 200,000 people who had gathered that afternoon in that place was listening. There was so little movement. And I thought, you know, for someone who is charismatic, that person should cheer people up, should make people, you know, applaud, raise their hand, jump up and down, do all of this energy stuff. And it only happens when the leader permits that to happen, right? Occasionally, Barack Obama made a pause for people to cheer and applaud. MENGES: And that's when we see the energy. That's when we see the jumping. And that afternoon, it became evident. And the person standing next to me, who after the speech, I questioned a bit - you know, what was the stuff that she liked the most and so on? - and she was unable to recall anything. She just said, you know, it was amazing; it was awesome. And so she didn't take away any detail. But what she did take away is that she wanted to go and vote and tell others about it. And it led me to discover something that I now call the awestruck effect. RAZ: Jochen Menges picks up this idea from the TED stage. MENGES: It is true that charismatic leaders instill positive emotions in us. They make us feel great. You're full of admiration, and yet a little bit too shy to express it. In one word, if you like, we are awestruck. Now, you may wonder, OK, why is the awestruck effect important? Well, it turns out that psychologists have shown for many years that when people suppress the expression of their emotion, as they do when they were awestruck, the intensity of the emotion increases inside of them, but they also suffer from a cognitive detriment, and that means that they're less able to understand, memorize and scrutinize messages. So whether they understood this stuff doesn't matter. Once they felt great about it, once they felt confident they had something taken away, they follow. And that means we follow charismatic leaders in part because of the awestruck effect. RAZ: So what is the connection between charisma and inspiring people to take action? MENGES: I think the charismatics are the one who are extremely good at inspiring action - perhaps extremely good just at inspiring, full stop. Whether they get people to engage in action is a second question. RAZ: Yeah, I'm thinking of someone like - you know, like Winston Churchill, for example, who was obviously a master at this. WINSTON CHURCHILL: I have nothing to offer but blood, toil, tears and sweat. MENGES: The charismatics use tactics in their speeches. The first thing is that they start out mirroring the type of emotions that are already prevalent in the audience. CHURCHILL: We have before us an ordeal of the most grievous kind. MENGES: If I am angry, and the person steps on the stage and says, you know, I'm angry and so, then I think, oh, that person feels like I did. So that person may speak to me. MENGES: But then they all of a sudden begin to question that emotion. They kind of ask, is it the right way to feel? And it creates confusion in the audience. And, of course, confusion is the best companion for someone who wants to exert influence, to offer an alternative interpretation. MENGES: And so in the last step, typically, what these charismatic leaders do is they offer a new interpretation. They also call us to action and say, here is the path forward. CHURCHILL: At this time, I feel entitled to claim the aid of all. MENGES: This is what I want you to do. MENGES: Let's do it together. CHURCHILL: Let us go forward together with our united strength. MENGES: Now, when I present this stuff, then usually, you know, at some point, a hand goes up and someone asks, weren't there leaders that sort of stirred anger, hate and aggression? And weren't these sometimes charismatic leaders, too? Yeah. I think not every charismatic leader has an all-positive emotion as Obama had. But it turns out that all charismatic leaders try to instill their followers with positive emotions. But some still stir anger, hate, fear, all of that stuff, but they do so to target it to an out-group, some other people that are to blame for, you know, our bad feelings here. And so they push the emotion away from them, thus relieving their own folks, their own in-group, their own followers from these negative emotions, creating a positive emotion instead. It's us, the great, versus them, the despicable. And inevitably, the next hand goes up and someone asks, so can this actually explain why sometimes people follow charismatic leaders even if they lead them over the edge of the cliff? I say, sure. I mean, you know, if you're awestruck, you don't even notice that you're wandering towards the edge of the cliff, right? The awestruck effect can make us vulnerable to bind to the wrong vision, to be dazzled by seemingly simple yet deeply flawed solutions and to ignore the moral deficiencies of charismatic leaders who appeal to our heart. RAZ: I mean, Jochen, there's a clear difference between dark charisma and an optimistic charisma. I mean, there's a difference between Mussolini appealing to people's fears versus a leader who says - like, you know, Franklin Roosevelt who says, better days are ahead of us. We're going to seize the moment. We all have the opportunity to be better people. I mean, that's a very different kind of charisma. MENGES: Yeah, absolutely. I mean, if it's appealing to positive emotions, it's the more hopeful type of leadership. However, you know, if you look at these dark leaders that have brought about bad things, they may start out with the negative. But they do that to then imbue in their inner circle - in their followers a sense of a brighter future. So as a matter of caution, it might be wise to just double-check is it making sense. Is it logically and rationally something that I can buy into? RAZ: You know, when we think about great leaders of the last 100 or so years, you know, they all seem to have been charismatic people - like Mandela or Churchill or Kennedy. RAZ: But then, you know, sometimes you think about leaders who had very little charisma but were actually quite effective, like Dwight Eisenhower. So I wonder whether leaders who have this positive charisma are better than leaders who have, you know, little or none. MENGES: I think they're more powerful if they're more influential. They're more likely to inspire action. Whether they are necessarily the one who sees through the action, I sometimes wonder too. Charisma is great to bringing about a movement, to getting us all inspired to walk out and do something. But it's not sufficient to just establish yourself as a dreamer and someone who makes others feel good. It's also important to then deliver upon your results. So my take on it is, yeah, you can be successful in other ways. But I think having someone at the top of a nation, at the top of a business, at the top of a team who can also make us feel great while we're doing something great is valuable in its own right. RAZ: Jochen Menges is a researcher at the University of Cambridge. You can see his entire talk at ted.npr.org. Transcript provided by NPR, Copyright NPR.